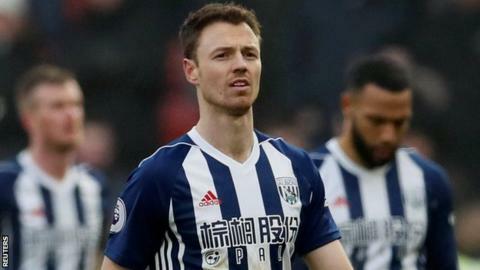 Some West Bromwich Albion players cried in the dressing room after Saturday's Premier League defeat at Bournemouth, says captain Jonny Evans. Bottom side Albion conceded twice in the final 13 minutes to lose 2-1, leaving Alan Pardew's side 10 points from safety with seven games left. "There was a lot of hope and optimism that we would get something from it. We were upset," said 30-year-old Evans. But he insists the squad still does not believe relegation is a formality. The Northern Ireland international also denies their problems have worsened since an ill-fated trip to Barcelona. He was one of four players - along with Gareth Barry, Jake Livermore and Boaz Myhill - who were questioned but not arrested by police in the Spanish city after a taxi was stolen from outside a restaurant. The Baggies have not won since the incident on a mid-season break last month. Defeat at Bournemouth was their seventh straight in the league - they have won just once in the Premier League since August. "People try and relate things that aren't always relatable but before we went to Barcelona and before the manager arranged the trip I think we were bottom of the league," said Evans. "Our performances throughout the season haven't been up to scratch. We haven't got enough points on board. "I think there is hope. It's not like we have got to the point where we have accepted relegation. "There were a few tears after the game at the weekend. We were ahead and then the game swung in the last 15 minutes and I think it has been the story of our season. It's hard to take sometimes. "Mathematically, though, we still have hope and we keep going until it is mathematically not possible. We owe that to ourselves and the fans to do that. That's what we will continue to do that."